German public broadcaster ARD has announced they will be airing a made-for-tv film in which a European family flees to Africa as “refugees” in a future where populist governments rule much of Western Europe. The film, entitled Auf der Flucht, or On the Run in English, features a family of Germans fleeing Europe as refugees to the fictional South African Union, according to a press release for the film. According to the description of the film, Europe is ruled by “right-wing extremists” in the near future, while the South African Union is seen as an economically and politically stable area in comparison. German actor Fabian Busch, best-known in the English-speaking world for his involvement in the film Look Who’s Back, in which Adolf Hitler travels through time to the present day, plays a lawyer who advocates for Muslims, homosexuals, and others persecuted by the now-totalitarian German regime. While the press release for the film mentions that Europe is in “chaos” due to the rise of right-wing extremists it does not mention any parties or individuals by name. While the level of crime in Germany have risen in recent years, especially among migrants, the crime rates still pale in comparison to contemporary South Africa, which has one of the highest per capita murder rates in the world. So-called farm murders, in which the victims are overwhelmingly white, are also at epidemic levels in South Africa, leading to a recent protest in which thousands of mostly white, Afrikaans-speaking South Africans took to the streets to demand the government take action. 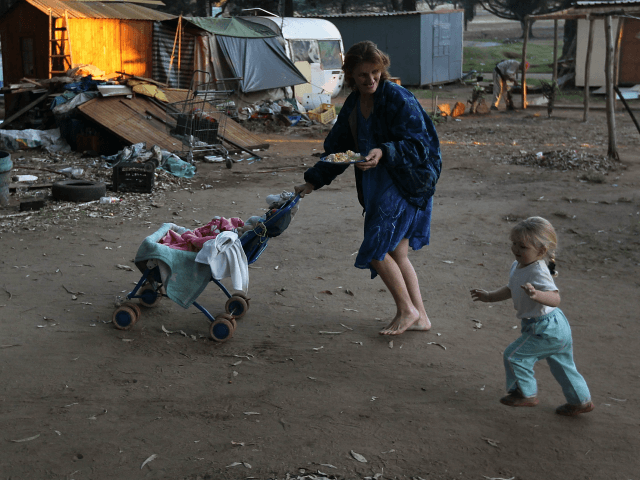 Some white Afrikaners already live much like refugees in today’s South Africa, in the many squatter camps across the country. Around 80 camps are said to exist where residents often go without food and running water. The German film is not the first in which a publicly-funded broadcaster has attempted to predict the aftermath of populist candidates being elected to power in Europe. Last year, the BBC released a multi-part radio drama in which a Front National candidate became mayor of the French city of Grenoble. The play ended with the entire city in multi-day riots and the newly elected mayor’s assassination.